Even a nuclear war won’t get you out of paying your taxes or keep the Internal Revenue Service from coming after you. 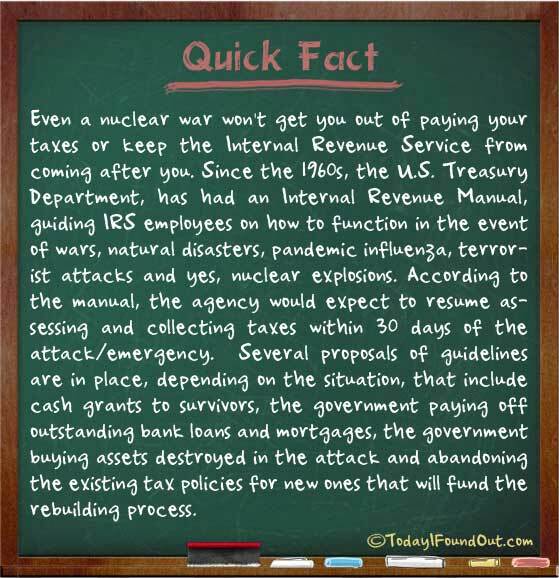 Since the 1960s, the U.S. Treasury Department, has had an Internal Revenue Manual, guiding IRS employees on how to function in the event of wars, natural disasters, pandemic influenza, terrorist attacks and yes, nuclear explosions. According to the manual, the agency would expect to resume assessing and collecting taxes within 30 days of the attack/emergency. Several proposals of guidelines are in place, depending on the situation, that include cash grants to survivors, the government paying off outstanding bank loans and mortgages, the government buying assets destroyed in the attack and abandoning the existing tax policies for new ones that will fund the rebuilding process. One thing I like about todayifoundout is that usually the stories are well referenced. It’s very disappointing when stories are not. What is your source for this article? Here were some of my sources for this quick fact: IRS Manual, Brookings, The NY Times.